Our Drama Club’s first outing with Shakespeare has been full of nothing but positive surprises. I’m sure it’s a honeymoon and road blocks are ahead, but you know what? I’ll take it. At our first rehearsal my objective was to disabuse the students of their fears: Shakespeare is not scary, and you can figure out what the words mean without any help from me. To do this I employed a few tactics learned at the Globe this past summer. This first strategy, however, was my own. I provided them with a Shakespeare Cheat-Sheet to familiarize them with some language basics. Elizabethan syntax still resembled its parent French and was largely Romantic in character. More than half of our cast is Latino, and the other half has learned Spanish in school, so I drew comparisons between Usted(es)/tu/te and you/thou/thee. Their usage is nearly identical – if you know how to tell the difference in Spanish, you know how to tell the difference in Elizabethan English. Similarly, if you know when to use I/me, then you know when to use thou/thee. After dealing with the language speed bumps, we got to the good stuff. I gave them a scene from the play where Demetrius tries unsuccessfully to shake Helena off his tail in the woods outside Athens. (Full disclosure: this entire activity can be found in Fiona Banks terrific resource, Creative Shakespeare.) It’s a brief exchange where each character speaks about four times, but each of their objectives is very clear. The students performed the scene five different times in five different ways with five different partners and were asked after each rendition what they discovered about the characters and their own performance. After we debriefed the fifth performance, I asked them to summarize the scene for me, line by line, which they were able to do with clarity and precision. It’s important to note here that I hadn’t told them anything about the scene (and even though they had their scripts, very few – if any – had read the entire thing all the way through). I didn’t prep them by explaining the situation the characters were in, and I didn’t need to: they figured it out all on their own. This is the bane of every English teacher’s experience with Shakespeare: trying to figure out how much to tell the students. When you are only reading the texts, it’s so much easier to just tell the kids what’s going on rather than wait for them to pick through it. But when you get them on their feet and get the text in their bodies, so much of the meaning reveals itself. And the students learn, and you don’t feel like you’re just showing off. Our third activity during the first rehearsal was a status “game” (also detailed in Creative Shakespeare). While it’s meant to get the students thinking about the status of certain characters in relation to other characters, they can’t help but observe the game’s relevance to their own lives. The instructions are simple: each student gets a card, but they can’t look at it – they hold it up for others to see. When everyone has a card, they begin to walk around the space and react to each other based on their perceived status. At first, no one knows what their status is, but very quickly they understand if they are a person of high status or low, and once they come to that realization you can see how their movements change. Those with royal cards walk confidently, and those with aces and deuces begin to slump along dejectedly. Not surprisingly, once they understand their status, they also begin to treat others differently. The insights they shared regarding group dynamics were deep and personal. I don’t know the degree to which it will shape their performances, but it definitely allowed them to walk out of rehearsal feeling like something profound and different is happening with this production. Likewise, the idea that Shakespeare is somehow too erudite and out of their reach is quickly melting away. As I stated in my previous post, I had a blast learning about Shakespeare pedagogy this summer. But I was already a Shakespeare devotee before this experience, and I’ve been performing as an actor/musician for most of my life, so it was sort of a given that I would tremble with a frisson of delight and wonder at regular intervals during the course of the three weeks. That said, I wasn’t awarded a generous scholarship from the English Speaking Union so that I might go and have a personally fulfilling experience — it was granted to me that I might bring knowledge back to share with my students and my colleagues. The programme, after all, is called Teaching Shakespeare Through Performance. How, then, will my teaching be different this year? Something the teaching artists and practitioners at the Globe stated on several occasions was that the exercises and theatre games we were playing were all born of the rehearsal room: vocal exercises meant to consciously connect the voice with movement; activities to help us embody archetypes to enhance performance; the encouragement to play the words completely differently than you did before. “We do this in preparation for all the shows here,” they told us. We weren’t made to do watered-down versions of of the actor’s practice, we were treated as professional actors. This ethos the first thing I will bring back to my classroom: I’m going to treat my students like they’re professional actors. This seemed to help even the most reticent performers among us to break through the fear. So did the scaffolding. This is edu-speak for the way you build your lessons toward a final objective or goal, and it’s the aim of every educator in the course of our unit development to structure lessons so that each bit of information and each activity builds on what came before. 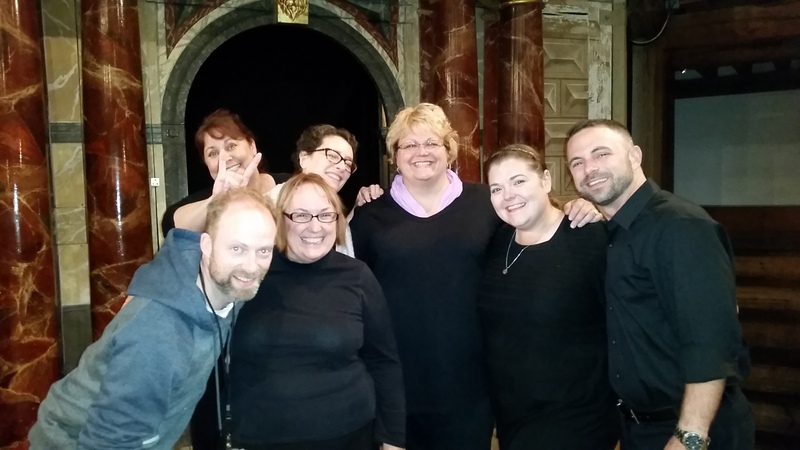 The educators at the Globe taught us ways to scaffold Shakespeare so that a student who felt totally stupid confronting his words for the first time (which is most of us, really) could be performing his works with total comprehension in a very short time. Start small. Don’t give students the entire intimidating text right away. Build up to it. Pull short, specific scenes to use with certain acting exercises and expand the students’ comfort zone. Don’t be afraid to cut text to fit your students’ needs — don’t rewrite or change words, but remove the parts that are confusing, then reintroduce them in time. Help them towards early success with a text so that they won’t feel as resistant to it as you go. Once you’ve got a chunk of text you can work with, there is any number of exercises you can do with it, many of which can be found in Creative Shakespeare by Fiona Banks. Fiona was our programme director and she took us through many of the activities in the book as if we were the students. I won’t go through all of them, but here’s one that I’ll definitely do with my students and will likely do with other teachers when I run professional development workshops. In the book it’s called “Adam’s 10 Point Plan to Performance” (p. 174-184) and — in an extremely condensed description — it works like this. You assign students into two groups and give each group a text with multiple roles (we used the thumb-biting quarrel from act one of Romeo and Juliet, cut so that young students could understand it). Once the students have arranged themselves in a circle and assigned themselves roles, they proceed to read the text in a variety of ways and from a variety of positions around the room. Each reading brings something new out of the performer, whether it be a sense of the rhythm of the words, the emotional value, their relationship to the other characters and the audience, appropriate movement. By the tenth reading of the passage, your students will have created a fully-staged scene without realizing that’s what they were working towards all along. This is just one of very many activities, techniques and strategies that we’ve been given to bring to the classroom, and the list could go on for many more blog entries than anyone would care to read. Suffice it to say, this was one of the best professional development experiences I’ve had. There are still several weeks to go before school starts back in New York, and I’m almost wishing it would get here sooner so that I could get started putting into practice everything I’ve learned. Teaching Shakespeare Through Performance has given me not only the courage but the savvy to produce A Midsummer Night’s Dream with our drama club this year — my first time directing a Shakespeare play. This, of course, means my drama classes will study it so that they’re prepped to see it; my hope is that by the end of the unit they’ll wish they had auditioned because it will be so much fun. My English class will study Measure for Measure (as part of a semester exploring the concepts of Justice and Mercy, which, incidentally, was my plan before I learned that this was also the theme for the Globe’s season. Synchronicity!) and Henry V (which we’ll see at BAM in April — I hope!). Most years I’ve taught only one Shakespeare play and usually slogged through it as a chore; this year we’ll take on three and I absolutely cannot wait — that’s how confident TSTP has made me feel! So: confidence, know-how, strategies, activities, passion, fun. That’s what I’ll be bringing back to the classroom. 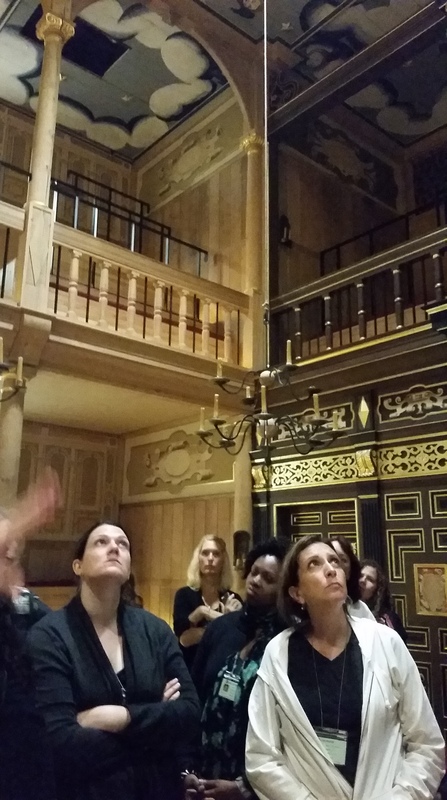 Fiona Banks, our Course Director, teaching us about the new Sam Wanamaker space. Today was the first day of our coursework here at the Globe. Wow. In this single day I feel like I’ve learned enough to revamp my teaching of Shakespeare and Dramatic Arts to merit the price of tuition…and there are 20 more days to go! But rather than catalogue the fantastic ensemble-building exercises we learned from Colin Hurley, who recently played in the all-male Twelfth Night/Richard III on Broadway, I want to reflect on the talk given by Patrick Spottiswoode, the Director of Education here at the Globe who worked with founder Sam Wanamaker from the beginning, before they’d even broken ground to build the theater. According to Patrick, Sam made his name in radio soap operas in Chicago and New York before being offered work in the UK. He might have returned to live in the US but for the fact that he’d made Sen. McCarthy’s infamous list and his friends told him to stay in the UK for the time being. Because he listened to them, the UK benefitted from his work at setting up the nation’s very first Arts Center (in Liverpool, I think he said…), and eventually he got the idea to recreate Shakespeare’s famed Globe Theatre. The project met opposition from all sides: from the political left and right, from the arts establishment folk to the “who-cares-about-Shakespeare?” philistines. Their reasons were many, but among them were the fact that the visionary Wanamaker was an American son of Ukrainian Jews and the chief architect, Theo Crosby, was South African (who were these foreigners to tell the Brits about Shakespeare?). But they were tenacious, and now it’s here. The Globe has now been open since 1997 and is now a beloved point of pilgrimage for Shakespeare devotees the world over. In a sad twist of fate, neither Sam nor Theo lived to see the Globe’s opening. They did, however, dream of one day building an indoor theatre that would be a functioning replica of one of the earliest 17th century indoor theatres (the next generation after the open air theatres like the Globe). 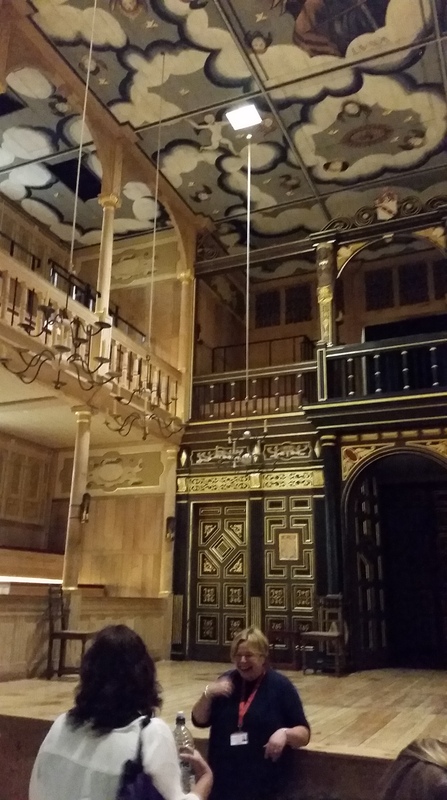 That day came last year when the Sam Wanamaker Playhouse opened alongside the Globe. It’s built according to the oldest surviving plans for an indoor theatre that anyone can find. There’s no evidence that any theatre was built using those plans prior to now (they seem to have been drawn up but then put aside for whatever reason), but it clearly matches general descriptions of the theatres that existed at the time. 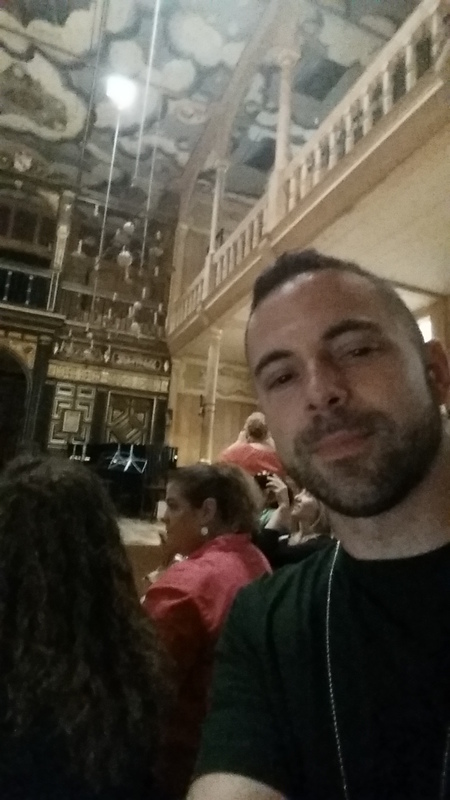 The Sam Wanamaker Playhouse is stunning. In our group of teachers there are several who have been to London many times and some for whom it’s their first visit. One teacher of the latter group was so moved by the experience of seeing the Globe for the first time that she cried. I thought, “Awww, bless her! Wouldn’t it be nice if I could feel that feeling all over again?” I was at the Globe shortly after it opened and have visited several times since then. But I’d never seen the Sam Wanamaker Playhouse until today. I can’t even tell you why it moved me so much, but as soon as we stepped inside I had a feeling of being transported in time, even more than I feel in the Globe. It’s candlelit and incredibly intimate; much smaller than the Globe — I can only imagine what the dynamic between actor and audience must be like in a space like that. I won’t have to imagine for long though: not only will we see a performance there, we’re going to be the first teacher group to perform in the space! Before coming here, I was giddy at the prospect of performing on the Globe stage, and I still am. 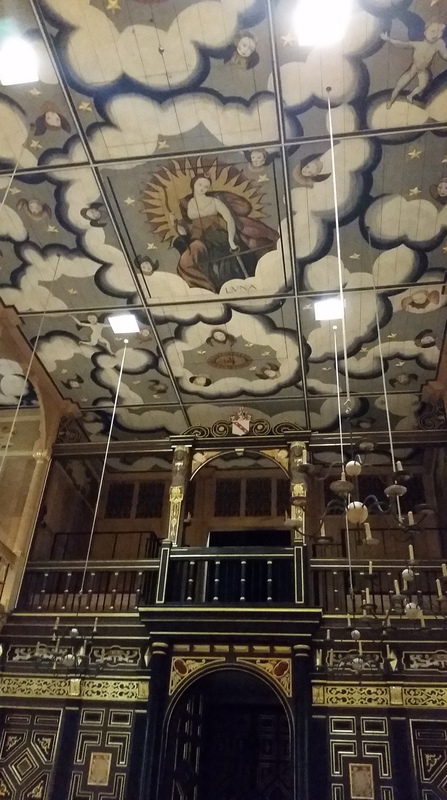 But I knew nothing of the Sam Wanamaker stage: even if I’d known we’d perform on it, it wouldn’t have meant anything to me. Now I’m giddy for two performances! So anyway, I cried. The story of what it took to create the space, from the visionaries who dreamt it, to the plans drawn up 400 years earlier that sat quietly awaiting their day, to the incredible words of Shakespeare that continue to motivate people to dream and build and create and perform…it was too much for me. I’m proud, excited and extremely grateful to have a moment on these stages and be a part of their stories.